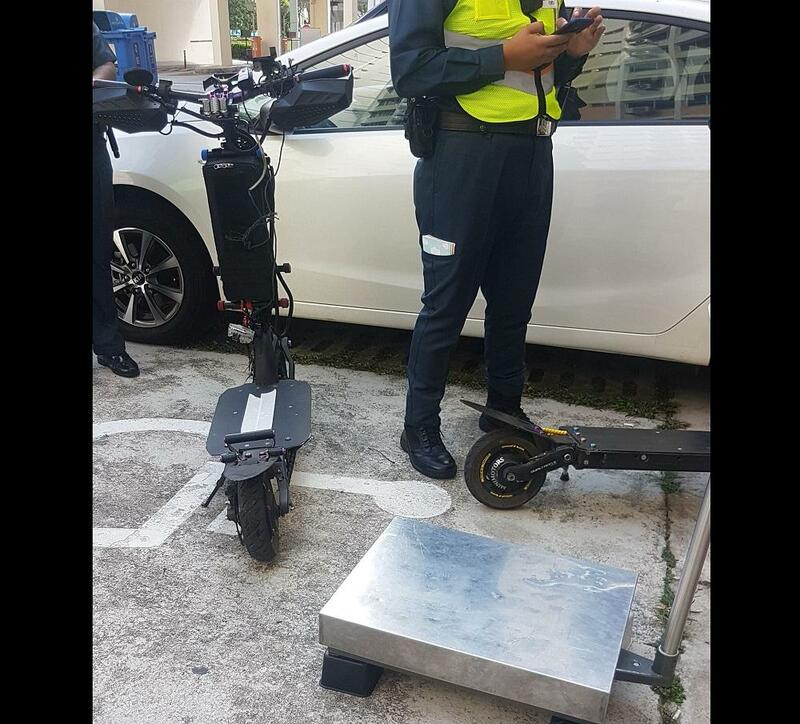 Illegal E-scooter Owner Who Rides Responsibly Cries Foul After LTA Impounds His Dualtron Scooter; Damage His Livelihood On CNY – Sinking It In! Mr Reuben Koh who uses a Dualtron (non-LTA Compliant) scooter for his daily livelihood made an impassioned online rant after LTA impounded his e-scooter during Chinese New Year. He lamented that he has an impeccable safety record and never once rode recklessly but is now penalised due to the rigid rules set by LTA. He questioned if it is fair that responsible riders like himself had to be penalised for the bad behaviours of a few bad eggs. Goodbye. You served me well. This is a long rant so pay me no heed if you would like. Yea, I own a Dualtron. Or at least I owned one. But so what? It was a machine, man-made. We made it. We rode it. We determined the route it took, the speed. Whatever happened, the rider was the one making the decisions. I never once knocked down someone. I never once thought I rode recklessly. When it was dark, I had lights. Even when my lights got spoiled, I had temporary less powerful ones as replacements. I had a mirror for when turning, or checking if anyone wanted to overtake me. I had handguards with lights which not just served as aesthetics but helped people on pavements know that my handlebar was this certain length and the lights on my handguards helped people to know that I was coming and they wouldn’t randomly get hit by my handlebar. Yea, we had our speed demon moments. Everyone who has something nice would like to show it off. Guys would know this best. Who wouldn’t like to show their new sleek ride off to friends? But I never did it on a crowded pavement, only in ulu areas where there weren’t many. I wore a helmet. I had a cam. Yea, i definitely had moments where I beat a red light, or rode across the road early when I wasn’t supposed to. But I have never known a driver that has never gotten any demerit points before. Come on la in all honesty, someone has made an illegal u-turn before or beat a red light rushing somewhere. This DT, cost me about $1700. It was all hard earned money. My own money, which none came from anyone else. Not even my own parents. They’re divorced. I had rough times with my mum in the past. Have moved on but I don’t keep in contact with her. My dad, I can’t live with him well. Had to move out due to certain situations and after police intervened asking me to live alone without him indefinitely. I’ve been skipping rental rooms, till recently I realised if I had to study, I wouldnt have enough for myself. Leaving me no choice but to temporarily stay with a friend at his place. My own expenses, my rentals in the past, and everything else that requires money; I all attain through my own work. I do GrabFood, while I started my own small scale e-commerce business recently, selling scooter items. Ranging from tubes and tyres, to brakes and other accessories. Through these two, I earn money, to maintain my ride which I use on a daily basis, as a mode of transport, for work, for doing on-site tube and tyre replacement, and for my leisure rides occassionally. Now, without it, I’ll lose quite a lot of income. My GrabFood definitely will lose out. I won’t be able to do any on-site services to replace tubes and tyres for any customers also. Yea, say what you like. “Change to compliant la” and etc. Talk is cheap. This DT cost me a mere $1700. Which is a lot, but why I said mere, is because for the same amount of money, in order to get a compliant one, I would have to go for something that cuts every spec of my ride in half, and could cost more. For a compliant weight Fiido to travel same amount of distance as mine, I would need to spend twice the amount. With my DT, I could travel 80km without any issues. This meant, transport to school > to work after school for a whole night doing GrabFood’s dinner rush from 5pm till 10pm > going whereever I was needed at night to replace parts for customers > and come back. It was possible. This was a routine for me. Yet IF I had spent the money trying to get a Fiido, it would get me half the job done, and cost me more than what I had to spend on my DT. In the end, yes I had something deemed illegal based on the masses that judged a man-made device to be not meant for use based on a certain minority of users that rode recklessly and caused nuisances. Yes I own a DT. I rode a device that didn’t fufill the criteria of LTA’s imposed laws. But reasons as to that, was my situation, and affordability. Even when I got stopped. My scooter wasn’t working. I was being towed back to my friend’s place. Even the tow rope can be seen. Yet, as if my machine meant for my income breaking down on me wasn’t enough, it still had to be taken. What is wanted of us riders to be compliant are costs which are unrealistic, even for a working adult, and even more so for someone like me. In the end, innocents like us delivery riders who use non compliant rides for the sake of affordability and worth get caught under the crossfire of the law made to go against errant riders but we face the brunt of the punishment while those who are meant to get caught scoot off freely. I have seen 13 and 14 year old kids on Dualtrons riding at full speed in PCN. Nothing wrong with that, except it’s 3 in the afternoon and the PCN is flooded with humans. These kids ride around with their faces barely above the handlebar going around unsteadily at 50kmph with their sweaty hands and shaky handlebars. Yet we riders who use these devices as ways of income due to certsin situations that require us to work in this line due to the better perks it provides are the ones most often risking getting caught. Great job.